We already know that Google is working on Project Tango, a mobile device that comes with advanced sensors capable of creating a 3D map of its surroundings. In fact, the company has already previously the Tango developer kit for smartphones early this year. Today, the search giant has announced a new developer kit that’s coming soon and this time around it’s going to be a Project Tango Tablet. The tablet is going to use NVIDIA’s powerful Tegra K1 mobile processor which uses a 4+1 configuration of the quad-core ARM Cortex-A15 chip. It comes with a 7-inch display, has 4GB of RAM, 128GB of internal storage, Wi-Fi, Bluetooth 4.0 Low Energy, optional support for 4G LTE, and will run straight out of the box on Android KitKat. Since this is a Dev Kit it is clearly aimed at developers who want to build applications surrounding the device. It comes with cameras that are optimized for computer vision which allows it to understand the concept of space and motion just as humans do. This allows it to map a 3D image of interior spaces. Real estate companies could build interactive, 360-degree “fly-through” tours. Interior designers could scan a client’s home and test design ideas, such as moving walls or inserting furniture. 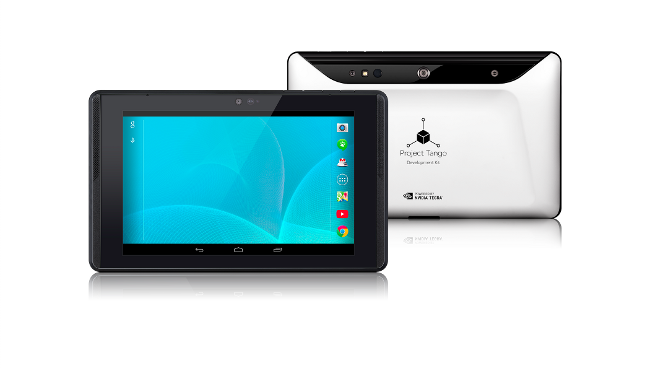 The Project Tango Developer Kit is expected to hit the market later this year and should cost somewhere around $1000.